Scientists in the UK have created a sticky tape which works in the same way as gecko feet. The researchers say the material clings so well to a surface that by covering the palm of one hand with the tape, a person could hang from the ceiling - just like the remarkable lizard. So far, however, Professor Andre Geim and colleagues have only been able to make a very small square of their gecko tape because of the difficulties involved in the fabrication process. Nonetheless, the University of Manchester scientists are confident they can refine their work so that commercial quantities of the new sticky material can be produced. It is three years since a team from California cracked the secret of how geckos are able to perform extraordinary climbing antics. 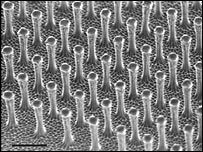 The researchers confirmed that tiny intermolecular forces - so called van der Waals forces - were produced by literally billions of tiny hair-like structures, or spatulae, on each gecko toe. These forces, which arise when unbalanced electrical charges around molecules attract one another, allow the animal to scurry up walls and even hang upside down on polished glass. Now, the British researchers have managed to create an artificial version of the spatulae. They have fabricated arrays of plastic pillars that are little more than two thousandths of a millimetre tall; the spacing of the pillars is on a similar scale. They are attached to a flexible base that moves to bring the minute synthetic hairs into contact will all the small undulations that exist even on the smoothest of surfaces. So far, a piece of tape just a couple of centimetres square has been produced, and, according to Professor Geim, it is just as sticky as a the real gecko foot. 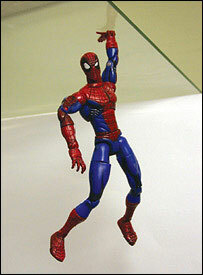 He told BBC News Online: "We demonstrated this actually with a small toy of spiderman which we found in the nearest shop. "We covered his hand with the gecko tape and he can stick to horizontal glass plate from underneath." 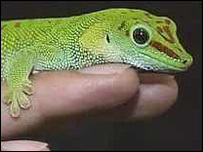 Producing the gecko tape involves processes similar to those used in making computer chips. It is long and expensive. "There are some problems we have to solve before this could be used commercially; the main one is that it doesn't stay sticky for long enough. "So we have to solve this, and that's why we're publishing the research now in Nature Materials. We hope some other people might be able to help us." Professor Geim has high hopes for the gecko tape and is convinced its remarkable properties will eventually find many applications. "We had this idea of making some tape the size of a hand and suspending someone outside the laboratory window. "We decided not to do it because it would have taken a long time and cost thousands and thousands of pounds, and wouldn't have proved anything scientifically. But we had lots of volunteers."